​​​​​​​​​​​​​​​​​​​​​​​​​​​​​Trying to “do more with less” is a constant challenge for society. Earth Overshoot Day in 2018 was already reached on August 1, breaking a record. Our planet will have to absorb an additional two billion people in the next 30 years, and the entire population wants to live a good and better life. For AkzoNobel, sustainability means delivering value for all our stakeholders. AkzoNobel has a strong track record of introducing sustainable coating solutions. It’s our driver for growth, innovation and productivity. We still see many opportunities for optimizing the use of material resources across the full coatings value chain. We will continue to do our part in the transition to a circular economy, while living up to both financial and societal expectations. What do we mean by circular economy? Transformation to a circular model is not the same as only promoting the recycling of paints and coatings. Circular economy means finding alternative sources for our raw materials, as well as extending the functionality of the materials in paints and coatings after their use. It requires a different mindset to recognize the potential for circular solutions, while overcoming legal and practical hurdles. When looking at the full value chain for our paints and coatings products, we know there are many opportunities to close the loop of materials. We strive to be resourceful, inventive and sustainable in enabling the circular use of materials and our products – and we need your help. Together, let’s find new ways to eliminate waste throughout our value chain; adopt alternative sources for our raw materials; or through innovative products, help our customer be more circular. Help us give paints and coatings an active role in the transition to circular economy, in a way that is sustainable and cost-effective. Let’s work together to close the loop of resources. 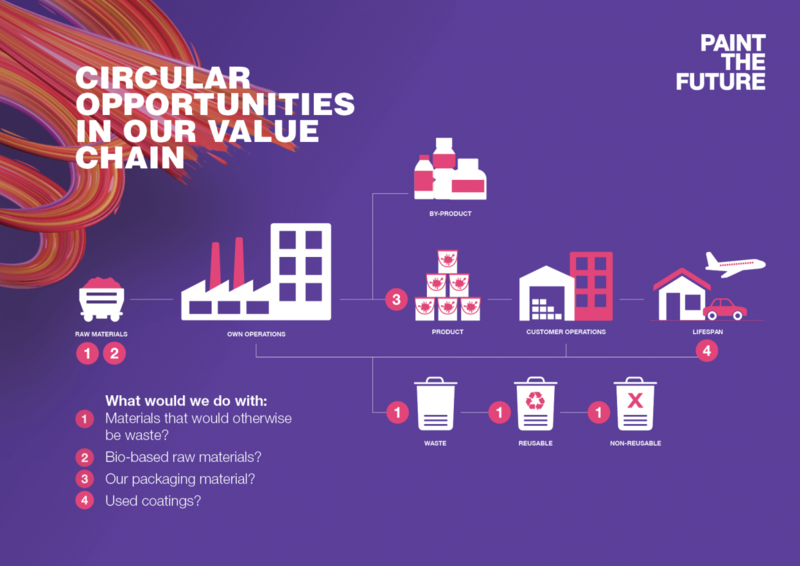 What can you see in our value chain that we cannot? Have you found a new way to improve resource productivity? Will your solution help us offer competitive and more sustainable solutions to our customers?